How Will Your Business Choose to Go Green? There are the obvious suggestions to go green at the office like being more aware of energy consumption – turn the lights in the conference room off after meetings, change the settings on your computer to go into sleep mode after a period of inactivity and try to avoid unnecessary printing and paper use unless it’s eco-friendly paper. If you absolutely have to print, opt for recycled paper that features high post-consumer waste content and low chlorine content. These are great ideas and will most definitely help the cause in addition to your bottom line. Still, there may be one way you haven’t thought about when going green at work. What’s The Harm in Carbon? Just about everything we humans do generates carbon dioxide. A simple task like making a pot of coffee results in the production of carbon dioxide from manufacturing of the packaging, to transporting the product to the electricity used by the coffeemaker. Carbon dioxide is the culprit behind global warming and climate change. 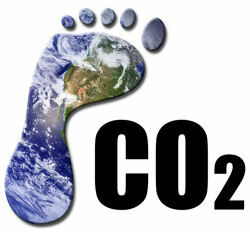 A 2010 study found that carbon dioxide made up about 84% of the greenhouse gases emitted by humans. To some degree carbon dioxide is a good thing – it is part of a naturally occurring cycle. Plants absorb carbon dioxide and release oxygen, humans inhale oxygen and release carbon dioxide and everything is right in the world. But in producing an excess of carbon dioxide in our modern lives, the natural cycle becomes overwhelmed and things do not flow as nicely as they once did. Burning fossil fuels in the environment kick out a huge amount of carbon dioxide, more than forests can keep up with. So we have an increased amount of greenhouse gas and less opportunity to convert this harmful environmental gas into a safer, more useable form that we depend on for survival. You can also look for eco-friendly ways to reduce your carbon emissions at work through buying carbon offsets. There are a variety of options and vendors out there so make sure you do your homework and research vendors before you jump in. There are a number of ways offsets can work. Some organizations sell credits and for each credit purchased a specific number of trees will be planted by the organization selling the credits. Initially this sounds like a great plan – trees are key to converting carbon dioxide into oxygen and humans are depleting trees across the globe, so planting more trees seems like a logical solution. There is some debate surrounding this method since there is no solid research and quantifying number that indicates how much carbon dioxide any given tree consumes, and it can take years for a tree to process a specific amount of carbon dioxide. Essentially, there is no way to scientifically confirm whether purchasing credits to plant trees is a financial bargain or if the buyer is being taken by the seller. Planting trees is definitely good for the environment so this system should not necessarily be ruled out because it is difficult to measure the success, it just proves that you should research, read the fine-print and do some soul searching before deciding if this is the best offset method for you and your company. Under other offset systems, you can factor how much electricity you use and purchase the equivalent amount of electricity produced in an eco-friendly manner (i.e. without burning fossils fuels). Wind farms and solar arrays are just two examples of how electricity can be generated without fossil fuels. Unfortunately not everyone has access or opportunity to purchase their electricity directly from such sources and this is what makes the offset so handy. It is also worth noting that under this scenario you are not paying for your electricity usage twice, you may just pay the difference in the expense of these two services, or rather the difference between the cost of electricity produced by burning fossil fuels and the cost of the same amount of electricity but produced in a renewable fashion. The eco-friendly carbon offset industry is a burgeoning business. Unfortunately there are no real regulatory standards at this time. Make sure to take your time and choose the carbon offset system that best fits your company and if you are not sure about how something works, reach out to the vendor and ask questions. Carbon dioxide offsets can help you meet your green business objectives, boost employee engagement and moral, and create positive change on the environment. Next Next post: What are the Pros and Cons of Banning Plastic Bags?